Explanation: Infrared wavelengths of 3.6, 8.0, and 24.0 microns observed by the Spitzer Space Telescope are mapped into visible colors red, green, and blue in this striking image. The cosmic cloud of gas and dust is W33, a massive starforming complex some 13,000 light-years distant, near the plane of our Milky Way Galaxy. So what are all those yellow balls? Citizen scientists of the web-based Milky Way Project found the features they called yellow balls as they scanned many Spitzer images and persistently asked that question of researchers. Now there is an answer. The yellow balls in Spitzer images are identified as an early stage of massive star formation. They appear yellow because they are overlapping regions of red and green, the assigned colors that correspond to dust and organic molecules known as PAHs at Spitzer wavelengths. 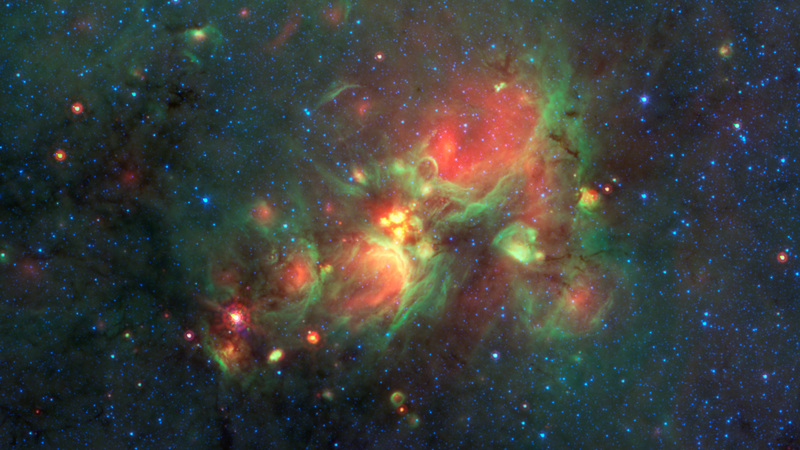 Yellow balls represent the stage before newborn massive stars clear out cavities in their surrounding gas and dust and appear as green-rimmed bubbles with red centers in the Spitzer image. Of course, the astronomical crowdsourcing success story is only part of the Zooniverse. The Spitzer image spans 0.5 degrees or about 100 light-years at the estimated distance of W33.